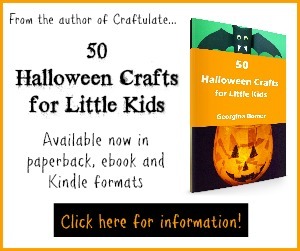 50 Halloween Crafts for Little Kids is a book in the “50 Crafts” series (written by the author of Craftulate! ), featuring all kinds of spooky crafts for your little ones to make! 50 Halloween Crafts for Little Kids will inspire you and your children to get crafty this fall! Each craft offers a simple list of required materials, easy-to-follow directions, and color photographs to help you along the way. The book features pumpkins, ghosts, black cats, monsters, skeletons, spiders, bats, and more! Which will your kids want to make first? The Puffy Paint Ghost? The Glowing Spider Jar? Or perhaps the Paper Plate Witches’ Hat! 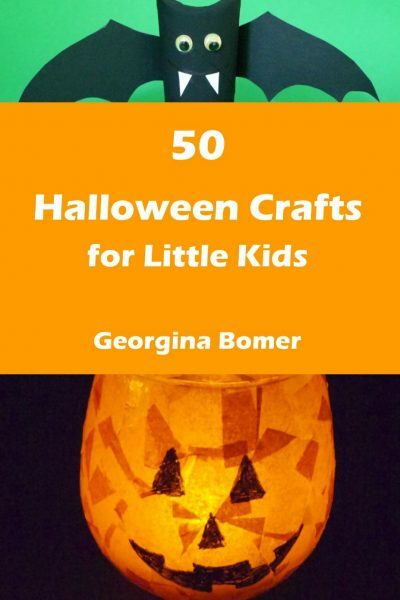 The book includes a range of craft styles; painting crafts, paper plate crafts, collages, wall art, decorations, fine motor crafts, and even fun sensory activities that have a Halloween theme. Also featured are some wonderful keepsake ideas: perfect for recording a moment in time! Try the footprint ghosts, the handprint black cat, or even making a googly eye frame!